landmarks surrounding the newly completed Grand Park in the city’s civic center, where CicLAvia will converge with the inaugural celebration of the park’s performance lawn. The upcoming CicLAvia comes a week after “Carmageddon II” September 29-30, during which 10 miles of I-405 will be closed. Organizers anticipate that more than 100,000 Angelenos will happily leave their cars behind again in order to participate in CicLAvia. The new route offers an unparalleled opportunity to survey Los Angeles’ cultural and culinary riches, including MacArthur Park’s majestic views, downtown’s bustling cafés and pubs, and historic Little Tokyo, with new extensions through the heart of Chinatown and Mariachi Plaza in Boyle Heights. There will also be a wide variety of activities, both planned and spontaneous, for people of all interests and ages, including music, performances, and games. CicLAvia is recognized as one of the city’s most innovative initiatives – a large-scale public celebration that has come to symbolize Los Angeles’ civic, cultural, and environmental resurgence. CicLAvia challenges the stereotype of Los Angeles as a car-addicted, smog-choked megalopolis, and gives people a chance to enjoy the benefits of the city’s improved walkability, public transit, and vibrant street life. Since it began in 2010, CicLAvia has quickly become Los Angeles’ most popular public event, consistently attracting more than 100,000 participants. “People love CicLAvia because it is incredibly fun, and there is a sense of camaraderie and community that is rare for a city as large and diverse as ours,” says Aaron Paley, CicLAvia’s co-founder and executive producer. 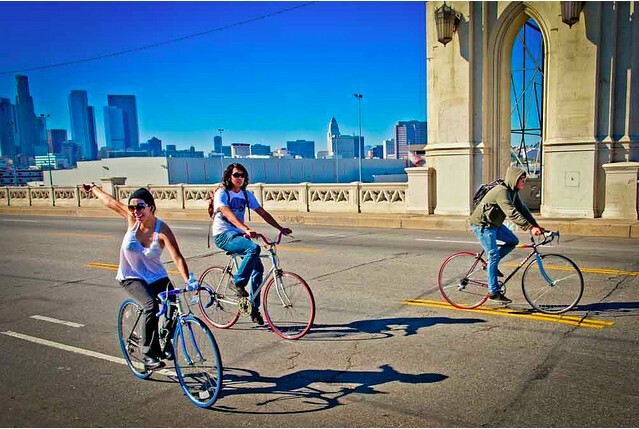 The CicLAvia route includes six hubs, each situated in the heart of a unique neighborhood and accessible by Metro Rail: MacArthur Park; Exposition Park; Grand Park at Civic Center; Central Plaza in Chinatown; and Mariachi Plaza and Soto Station in Boyle Heights. CicLAvia is free of charge and open to all. No reservations are required. For more information, or to download maps, please visit www.ciclavia.org. 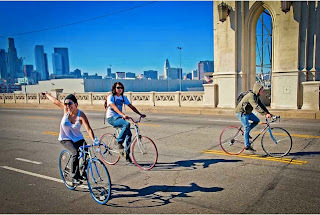 For the latest CicLAvia news, become a fan on Facebook or follow us on Twitter.